This part is about Hewlett Packard. One of the most interesting companies in it's best days. I think today, they employ people like any other company. One thing, all employees knew about. It was the HP-Way. A 10 points list, introduced when the company was small, but it was used with great pride still, when I joined the company 1986. One of the points was called 'open door policy'. This meant, it is allowed to contact the next higher management level when you disagree with your own manager. The rule was, that this was allowed, and this should have no negative effects on the employee. Of course this will not help to solve a conflict, but the result is another. A manager has the choice, not to create such situations, and if he does, he better speaks with his own manager first. Of course it belongs to good management in all situations, but the open door policy prevents bad management with respect to this. This is typical about how things were done. Just a small rule, just 10 words, but it had a tremendous effect. I never had the opportunity to meet Bill Hewlett or Dave Packard, but my main question to them would have been: What is your recipe for keeping such a company on track, the way you wanted it. From my observations, they had a recipe for managing people, one for building products, and one for the company as a whole. With people they were managed the same way as in small company, and it was called officially 'the HP-Way'. It is obvious this was inherited from the days when HP was small indeed, but they kept that spirit alive on purpose and with system. Later generations of managers did away with this, as soon as they had a chance. A very good book about this subject is called 'the Hp Way'. You find it easily on Ebay, as all employees were given a copy, so very many of the books were printed. A basic element were the famous coffee breaks in the morning, where you could ask really anything to anybody, over a cop of coffee. Where I worked, in the sales building, the coffee tables were too small on purpose, so you could share it with maximum 3 persons only. Many times you were face to face with two other people you knew only from seeing. Of course you can say only 'good morning' as if you just come from a funeral. But when you just say 'how is your day today' sometimes you are asking a high level person, and such people normally would just tell you. But you had to ask, and that's what I always did. Comparing that with the stiff, and 'layer' oriented structures of most other companies, the HP way is for me the favorite way. But fair enough, this is history now. For the products they had the 'environmental test manual'. That was a fat, red book, that I have an old copy of still. A masterpiece that is. Wow... making pass your equipment those tests, really unveils the design errors. Have you ever received a broken product in the mail, stupidly packed by somebody who did not care? Well at HP, to get a product release, you had to prove it can pass the packaging tests. For that the developer had to pack it in the official product carton, and like it has to be qualified for shipment. So the requirement is, it can be shipped, using the product carton as a shipment box. Now, THAT is a requirement! There were internal test labs for that. No pass for the test, means no product release. They would first drop that box on each of the 8 corners, and than flat on each of the 6 sides, on a steel floor, by using a special machine for it. So there is no personal factor. I once had the opportunity (and fun) to watch such a test, in the Boeblingen site. They drop height, I believe was 130cm. Quite high. The Product R&D manager needed an official, 'no visible damage' report from the lab manager (my Dutch fellow countryman Bart). Another department would verify the functioning, and those two approvals together become part of the product release documentation, which can be audited by an internal and external auditor, at any time, without anouncement. I have an old HP 130C tube oscilloscope here. It is hard to carry. What an idea, to drop this machine from 130cm eight times, on each corner, and then 6 times flat on each side. I would never do so myself. But it is good to know, at HP they did so, and the machine is designed to survive that. Actually I bought it on Ebay, and because it's an HP product, I just knew it is very hard to damage in the post. For the company itself, the overall idea of Bill and Dave, was organic growth, by technological leadership. Make products, with build-in quality, that only highly motivated employees can build the way they do. I think the old men never intended anything else, starting that way in the garage, and doing so until their last day. It creates workaholics. Many employees were of the kind that made sketches on Sunday, of how they want to do things on Monday. Myself included. My free time, and working time, it was the same. I think that was not because we were different, but we were managed different. It is hard to describe. People were managed with honesty. You knew it, and you wanted the best for the company too. Well at least it worked for me that way. When I visited HP Labs in California for the first time, I felt like Alice in Wonderland. I saw miracles where ever I went. In the company in Holland, where I worked before, I shared a 40m² office with my manager, with a glass front and great view on the landscape. A woman was bringing us coffee in the morning, and tea in the afternoon, and the daily mail. That was really a nice place to work. However at HP USA, everyone worked in an isolated workspace, with dimensions of 2x3 Meter. You might think this was terrible, but I saw only happy employees. The walls were 170cm high, meaning you could not look outside, unless you stand up. The workfloor hade mains streets, and side streets, and everywhere these workspaces, same like little appartments. The were no numbers or peoples name on it. You simply had to know where somebodies place is, or you would never find him or her, in a forest of anonymous appartments. And they seemed to like that. To find somebody, is almost impossible, because there was no official map of this, So I would just walk over to one of the many meeting places. These were similar like the normal work places, but you could find those easily, because of a writing board standing upright. In the meeting places was a phone, I would dial the persons number, and ask him to stand up. That was always fun to do, because it was considered a little bit like bad manners, but they kindly accepted it from visitors. So yes, they were 'captured' in their cubicle, but on the other hand they were given great freedom. As long as their results were good, they were not troubled with useless control. So the cubicle was also a bit their home. They had great freedom and little control, and they all worked very hard. For electronic engineers the 1980's were a great time, provided you were working in the right company. All modern things, it basically existed. 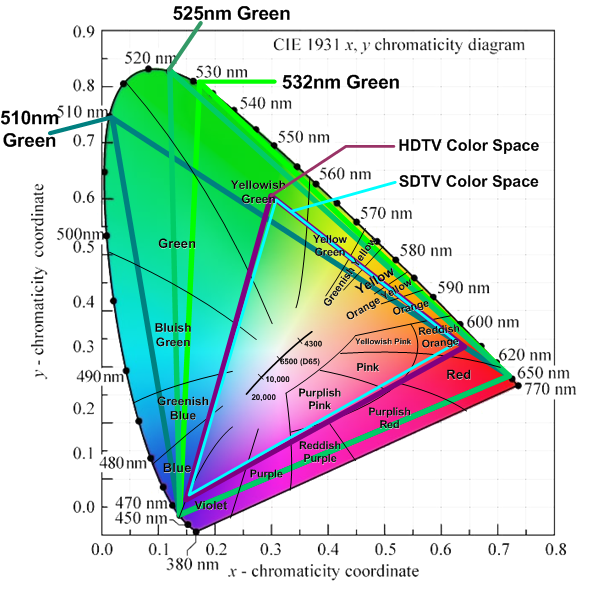 Integrated circuits, LCD panels, Personal computers, Solid State lasers, Satellite TV, phased array radar, anything. Even cell phones, huge as a suit case, but some people had it. It seems to me very few new things were invented ever since. There were men on the moon, and instruments on Venus. I see no difference with today, apart from one thing: The worldwide web, but that's just a development, no invention. At HP we were so close. We had already Email at HP. It was internal only, but it worked worldwide, and it was 10 years before the internet took off. I don't know who invented the Telex, as that was the first email, but I do know HP was the first company selling email systems. 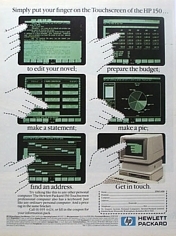 To use it, you needed a personal computer, called HP150. It had touch screen. Sorry, no Apple invention. You had to buy a mainframe computer, and run a system called HP Desk, and an HP150 computer for each user. It l worked just like today's email. No difference whatsoever. It can not be described what a MIGHTY tool that was. In the company before HP, best thing we had was a fax machine. A woman would bring paper maps around with hand written mail, or by type writer if it was official. Then at HP we had real email. I loved it, and I used it very much. Better say I was addicted to it. All other companies worked with type writer documents, or Fax by a lady had to send it. We had Email already in 1986. If that is not technological leadership, then what is? Do you think Apple invented the touch Screen? I had one on my desk, for my Email, already in 1986. About Changes, errorz and Misstakes. No risc no fun. This is an old, funny sentence, HP Used to sell their Computers, using 'Reduced Instruction Set Computer' Chips. But there is such a thing as an intelligent risk, and it's opponent: a stupid risk. Somewhere around 1993, HP began to change from an engineering driven company, into a marketing driven company. At the beginning there was no visible agenda for it. It sort of just happened. It seemed to me, when Bill Hewlett and Dave Packard have died, with them died the unforgettable spirit, these two men gave the company. Soon after, the first marketing psychopaths smelled their chances. It's just this kind of doing things, just because you can. This behavior is very common amongst human. Just take a good look at what a group of young kids are doing. One kid will kick another. obviously for no reason. But there is a reason! This puts him higher in rank, when he gets away with it. They have an instinctive feeling for this. You can observe the same in the zoo. There is the largest monkey who owns the best sitting place on the main rock. Just he has to leave that position occasionally. Then, you see the second largest monkey jump on the rock instantaneously. The old one doesn't like it, but he can't avoid it for 100% of the time. For a short moment, the second important monkey demonstrates his rank, just by sitting there. He is only disturbing the order, but that is the purpose. He is just showing he can do it. When the boss comes back, he quickly makes place. But of course all the females saw it, and that is very beneficial for him. You don't need to search very long to see this behavior within a company too. Actually it was just like above, what I saw at HP as the old owners died. Of course just indirectly, I never had a chance to look at their empty chairs. Small groups of people teamed up with totally new ideas, that the old founders sure would have rejected, but they're dead anyway. Silently and uncommunicated, the 10 rules of the 'HP WAY' were forgotten. I remember many people objected. This was historical company DNA. From now on, the company was ruled with respect to the direction from where the wind was blowing, and where power was coming from. Management had all kind of ideas, and if they could do it, they just did so. They even created slogan for it. Called: Manage change, to break away from the rest. What a sick verb that was. This 'rest' was not an external company, it was other parts of the company! Instead of teaming up, they set up divisions against each other. Your team is successfully breaking 'away from the rest', and the 'rest' are other teams. That could be your whole department, your business unit, or just yourself. Everybody, every team, had to break away from 'the rest', and show how great you did that, and you were the king. Even worse, they did the same with strategies. Just find out something that breaks away from the rest, and there you go. Nice for you, but not so nice for 'the rest'. Effectively, this disposed quickly of the original direction of the company, and it was the beginning of a long chain of changes, that to my opinion will be the end of the company, one day. Well, but let's not hope so. A new benchmark was introduced: CPOD, Cost Per Order Dollar. My prognosis was, and still is, this will change the company DNA too much. Any division with a higher than average CPOD was told to improve themselves. Even though they were already profitable since 40 years, they were now doing things wrong. CPOD ranged from 33% for the extreme technical products, to an amazing 4% for the Printer Division. This 4% stunned us all. The new idea was, to dispose of all 'higher cost than average' divisions, products, sites, buildings, people and other things. But what to do with 'the rest'? What to do with these departments, products, and people that belong to it? They found the ideal purpose. They were outsourced, and HP keeps the rest. So that 33% CPOD Product Line was the first one to be sold, directly after this benchmark was invented in 1994. So the company started to benchmark profitability of products lines against each other, departments against each other, geographical locations, and sadly even people within the same department were benchmarked against each other. Forgotten was the HP way. Later on, I mentored a student during his practical year at HP. After he saw all the benchmarking, he told me he benchmarked HP against his other future employers. I simply bench marked HP from my own view. My benchmark was, a good company puts 10% of his revenue back into R&D. That is impossible with costs of 4% per Order Dollar, as there is 6% missing. The results of this is clear: New technology can no longer be a key product, for such a company. But what will HP sell, if in the future it will not be technology any more? Is that the main idea behind the lowest possible CPOD? Chasing lowest CPOD, was like letting the ghost out of the bottle, without knowing how to get it back in, when the ghost doesn't do as you please. It kills the technical diversity within the company, and I could already see HP end up with a narrow product line, of high order dollars at low cost. Just as they want it. Great for the moment, but then life gets dangerous. That is because technological leadership comes not at lowest cost. To be competetive with the Chinese, you must have a low cost structure, they said. Competition from new regions will come our way, and the only way to keep our position, is grow faster as the market, at lower costs. Well, and it came that way. However you can not grow faster than the market for ever. This is the problem that sits on your back one day. So, the day will come, when the market saturates, and 4% COPD for printers is too high then. I mean, what will you do, when your costs are as low as can be, and you get under life threatening cost pressure? Probably it catches you at the wrong moment, as these things always do. Well, when time comes, we will know. Earliest at that moment, you want the ghost back into the bottle. Only now, the ghost will say 'no' to his master. I have seen good times at HP and never any really bad times. I did see times that were just below average, and instinctively the company reacted with the full program of job cuts, salary freeze, travel constraints, asking you to pay back holidays, and early retirement programs. The only way to save costs is reduce production and fire people, or give up production completely. After you completed the process, you will end up selling 'services' at lowest internal cost, moving to parts of the globe where salary is lowest. Today to India, tomorrow to Africa? Who cares. The process has started already. Main thing is, low cost. But..what is left of the HP way? I wonder what would the Bill and Dave have said, when their young company was expanding so rapidly in the 1970's, and someone would say a lowest cost approach with as little product diversity as possible, is the 'future'. I really wonder what the old men would have said. After the founders died, the company quickly changed. I made this prediction first time in 1993, Hewlett Packard may get in deep trouble on the long term, when they have disposed of everything which costs money now, and brings nothing on the short term. Still it is so tempting to do this with a high cost structure company like HP. Simply cut costs wherever you can, and raise your profitability in the same ratio. That may put the company in danger when a bad period occurs on the PC and printer market. Problems have a tendency to come unforeseen and are unchangeable. That can bring the company is in danger, and when it goes wrong, nobody feels the blame, because they will say the disaster came from external. I do not hope this for the people who still work there, but when HP has to shut down, due to 'external market' disaster, I will add it here, saying I knew it. The Acquisition of the Palm Company. HP tries to forget this episode, so let's have a closer look why this is so. Now of course, we all know better afterwards, but this acquisition was not a very intelligent one. I was given a Palm PC myself, when I worked for HP (later Agilent) in 1999. A Palm PC looks like a smart phone, but it is none, because it has no phone inside. For the rest it would do pretty much the same things. You could read your email off line on the airport, edit Excel files and contact people via an Infra Red LAN if a collegue was there with his Palm too. For it's time it was an amazing device, as it could run Microsoft Outlook with all it's features. So in a meeting, you would simply use your Palm, read to the others things they did not know yet, set the next meeting with the people that also had a Palm. Wow... they envied you for having this device. Then you would go to your desk, put the Palm in your docking station and the new appointment would appear online for the everyone who had a desk top PC. Moreover the battery lasted several weeks (yes!). Something a Smart Phone can only dream about, and the Palms would directly communicate under each via Infra Red, or office LAN. And there were no virus. I never saw it, but that was a hype in San Francisco area, to exchange messages in the subway with random people. Well you must see, this was totally new at that moment. I mean today your effort is how to avoid unwanted messages, but not in 1999. That was the PALM PC. Short after, Blackberry came, and they had a real mobile connection, but PALM did not have that. So with the same speed as PALM entered the markets, they lost it again. The smart phone as such, came in slow steps, but PALM lost it's connection to this market, and the company was in a starving mode. During that time, it was at decided that HP would NOT develop a smart phone. Then, suddenly this decision was regarded a mistake, and in a hopeless attempt to enter this market quickly, they bought the PALM operating system for the stunning price of.... 1.2 Billion dollars. Yes you read it correct. Not 1.2 Million for a useless, outdated operating system, but 1.2 BILLION. This is not a joke, look it up in the internet. It's a historical mistake. So thus sum of shareholders money for a company, of which they only wanted to have the software. Which was totally outdated software. But to make it worse, they did not just buy the software, they bought the whole company, which was one big pool of trouble. HP had to dispose of the PALM employees and other legal obligations, and have more costs from this. I never understood this wisdom, because I know the PALM OS would run the Microsoft applications, which was the only useful feature to my opinion, BUT we all know that Microsoft products are eating memory and waist PC speed, and makes you get stuck with slow performance, and an outdated product much sooner as you like. And it was just this what killed the Palm. So what is the big thing, entering the mobile phone market with such a Zombie product, Microsoft infected. And then pay 1200 Million US$ for it? No, no, that can never be right. Quite useless was the Infra Red WLAN, as this was a dying idea, and though later Palms hat blue tooth, it was just not a good wireless standard. Yet, HP did it. The result was a smart phone indeed, but it was completely unsuccessful. When the product was introduced, it was already too slow and too expensive. In the end they sold them internally for 50 Euro to their own employees , who effectively wasted their money on it. HP silently gave up on this, and released the code as open source, in a final attempt to do at least some damage to the competition. All I know for sure, they wasted 1.2 Billion on buying the PALM software. And not just that. 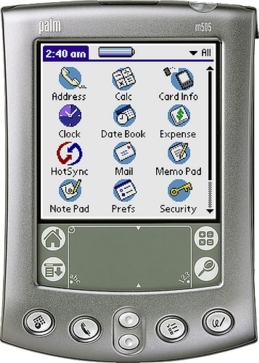 They wasted many more millions developing this into the first and last HP smart phone, and also had to pay all those PALM Employees afterwards, to leave the company. So how many billions it has cost to develop this into a smart phone, I do not know, and perhaps it is better not to know :) Sure is, it would have been better to give 1.2 Billion to the shareholders in form of dividend. This sure would have done more good to the stock price, as burning money in great style. These kind of things sure would have made Bill Hewlett and Dave Packard mad as hell, but as they passed away years before, the wise guys from marketing could now finally do the things they learned at school. Split of HP in HP inc and HP enterprises. There is little to say about this. If you search for a revolutionary idea behind this, you won't find any. It is more in line with a 20 years history of separating high profit business and low profit business, with the usual disrespect to employees and stockholders. The way how HP has put the money from stockholders pockets into tax office pockets, was unhygienic. So, business as usual. I am not proud of this, but Carly Fiorina, 2016 presidential candidate, was our highest boss at Hewlett Packard. To my opinion she was the biggest managment mistake, the company ever made. After she came, things changed in a devastating way. Before Carly Fiorina, HP was a company that managed to transfer break-through inventions into real products. These were truly state of the art inventions at that time. I remember when I was 14 years old, my chemistry teacher had an HP scientific pocket calculator the first one on the market. The whole class was gazing at it, and I remember me looking at this miracle product, and thinking: how on earth can people build such complex function in this tiny device on batteries. We used a slide rule for approximate calculations, and 'table book' for calculations that gave a few digits precision. This is a small printed book with results for all possible multiplications. Like you can look up 1223 x 5232. I still have it. And then look at this pocket calculator. That was my first time with an HP product, and it would not be my last. Then, 20 years later, I worked for this company. HP developed not just the pocket calculator, but also ink jet printers, the first Personal PC with touch screen, the first LEDs.... and many more things. They changed the world more than Apple Computers did. HP was always there when these (and a lot more products) were born. Under Carly Fiorina, this changed. Suddenly the management had a 'cost problem' and had to focus on lowering costs, instead of being one of the major innovators of Silicon valley. 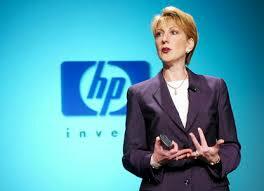 Ironically she changed the logo to 'HP Invent' while really she cut just the innovative part out of the company. Suddenly profitable departments were told to cut cost, so they would become as profitable as the printer division too. That was hard to do for some, and actually impossible for others, though these were all profitable divisions for decades, and the hearth and soul of this company that was the birth place of Silicon Valley. A shock wave went through the company, although I was sure we were in a financially healthy situation actually. We were told we were in trouble, and Carly was going to save us, but it would be hard, and it would only work if everybody will help her doing so. You could just smell her hidden agenda with everything she did. I remember she came to the Boeblingen site in Germany, where I worked, with a rental Helicopter, which cost the company 10.000$. What a way to tell the employees about a cost saving program. She had a great talent in getting the women on her side, but it was always in this 'conflict' kind of way. She fed the women with this feeling they had lower chances, just because they are female. I can tell you, when there is one company where everybody was equal, it was HP. But she did it, and it became even something for open discussions, how to 'solve' that problem. The solution was, that higher level managers selected new managers, discriminating male persons in case they were better qualified still. But Carly made her calculations cold as a block of ice. I saw the women in the company adore her, and she knew it. Given also a fair percentage of the male personal liked her cute face, she had the majority at her side. The situation was dangerous, because many felt they could trust her, but there was no proven record. Such a woman who intrigues and seeds emotional problems everywere, to my opinion is not suited to lead a company based on the work of the best designs engineers. I have a link here, to a discussion with Donald Trump, where she tells how terrible the business situation at HP was, before she came, and how she doubled and tripled the results. This is simply not true. HP had very many cycles of doubling and tripling results before. Over and over again, and it was all without her. Just her method was to let everybody believe, we were in deep trouble, and then she did the impossible, and turn the troubles into great result. Every other useless politician knows how that is done. I Imean it's a proven political method, to get better from troubles that you create first, and then profile yourself as the savior. She was changing people's attitude. Some that felt always 'one company', now, became internal competitors, not helping each other any more. It worked for her as a person. After a while we all felt we had problems coming up, and we all began to develop this feeling something needed to be done. More and more people were prepared to bring sacrifices to her. Like no salary raise, travel constraints, use old equipment, or give away some part of your holidays. We had hard times coming up, but we had a savior, and our saviour has a plan for us. Her name was Carly Fiorina. People felt lucky to have this strong person in charge of the future. As she left Lucent, she had a small problem, that needed to be solved before she could come to HP. It was a huge amount of (quite worthless) stock options, that she could only exercise when she would not leave Lucent. A stock option, is the right to buy a stock for a certain price. It is preferred that this price is higher than the market price. Like this, the options are officially worth nothing, and you pay no income tax on it. Suppose a stock is traded for 30$ and you have the option to buy it for 300$, that option is worth nothing right now. But of course it will have a value of 20$ when the stock raises to 320$, and when the stock goes up steadily, it is just a matter of time. When a stock splits, the stock options are split also in value, but the quantity is also split in the same ratio. Knowing this, it's a good idea to receive 100.000's of stock options, as a tax free reward. And then just stay on board long enough, and you earn 10's of millions of $ for free. That's nice for your retirement. Also for the company this is nice, because they higher management pays itself with options, that costs no money right now. They just print them like money. 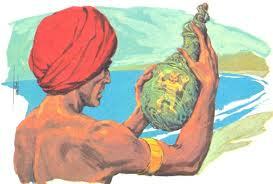 The profit on this is not taken from the companies bank account, but through inflation of the stock value. This is the reason why management loves to fill their pockets with stock options). So to make her change to HP possible, they gave here a similar amount of worthless HP stock options. Those options would only have a value when HP stock would rise to a value, which was believed to be unrealistic anyway. So they gave her the illusion. Only... the Hewlett family made that calculation without Carly Fiorina. It was her job to do the split of Agilent and HP. She was in charge of that, and in possession of a huge amount of stock options. Can you add up 1+1? So what happened then, was a pre programmed mistake for the share holders. She started cost cutting programs everywhere, and she did so in the middle of a financially healthy situation. So that made the HP stock rise sky high as it never happened before. Look at the historical stock charts, this was really crazy. There was another reason why she wanted that, because the Agilent-HP split would be a larger advantage for HP if the HP stock would have a higher value, at the moment of the split. So I sold my HP stock, 3 days before the official split, and I said: This is an historical, manipulated and artificial high, and we'll never see that again ever. Even today, 1/5 of a century later, that value of the stock is not reached. That, and some more things, was Carly Fiorina. Selling off Agilent for 3 or 5 times what it was really worth, sure gave here a lot of respect, and made her the real Captain of the Ship. For that moment. But you see, HP is not a boat. Hp is a company, owned by the stockholders, and Carly made her calculation without the Hewlett family. Later on, when she had to prove her captain of industry capability, there was disagreement with the Hewlett family, who rejected her ideas to kick out the computer business. Though she insisted on it, and kept on acting like the 'boss'. Then, the Hewlett family said, fine so you're the boss, but you're also an employee, and we are the share holders. You can fire an employee, but employees can't fire the stockholders. So they took a lawyer against her. What a crazy situation, an employee in legal trouble with the stockholders. As I tried to express before, the stockholders can't be fired, and stockholders can block any decision which has to pass the stockholders meeting. Now Carly made a miscalculation. Sure, the Hewlett family had less than 50% of the stocks, so they are no majority, but the other 50% doesn't necessarily have to vote in Carly's advantage. And that's what happened. Initially she made the Hewlett family in their role as stockholders loose in court. After that, she got blocked by every share holders meeting. She lost her power, because she could only decide minor things, that need no approval of the stockholders meeting. What is so typical of her, during her presidential campaign, she tells that she has business experience from leading a world company like Hewlett Packard. I saw her telling this on TV. Look at this video here, this is not my youtube account though. At 1:06 the moderator gives her an open door, and look how she walks through that door, at 1:40 of the video, making Donald Trump her life time enemy. This is exactly how she is. The truth about her 'leadership' was: She was fired by HP. Also, what is interesting about Donald Trump attacking her 'smile', he instinctively feels she wants to be the attractive looking business woman, while she is not really so attractive at all. So he attacks her on her looks. You can say about Trump what you want, but this was a masterpiece move. She reacted like a poisonous spider, and not like the future president of the USA at all. When Agilent was split off Hewlett Packard, I found myself working for the Agilent Medical Division, and later at the Optical Components Division. Which I never asked for. This splitting game, this selling of company divisions, in a chase for profitability, it didn't stop. My modest prediction was by then, this is going to be the end of this company on the very long term. This was not the company any more I wanted to share my active life with. I had to face it. I started already in 1993 with my own company, and still working for Hewlett Packard at the same time. Then in 2003 I quit my job, and started all for myself. So now when I do something right, I can put the result in my own pocket, instead of in the HP company pockets! Looking back, this was a very good decision. I should have done so before, because you only live once, and your time runs out before you know it.